In light of the recent box office success of War Room, the Kendrick brothers' (Fireproof, Facing the Giants) latest faith-based film, I have a question I've been pondering. The vast majority of film critics, both Christian and non-Christian alike, have been quite negative about War Room; it currently sits at 36% on Rotten Tomatoes, and this critique in Christianity Today is one of the more positive reviews I've read...and it's not very positive at all. War Room's heavy-handed script, underlying misogyny, and unhealthy view of abusive marriages (just stay with your terrible husband and don't talk openly and honestly about your problems; simply hide in a closet and pray that he throws up while trying to cheat on you!) are all problematic, but particularly troubling is its theology. War Room portrays a Christianity of merit and moralism, i.e. if I pray hard enough, then God will bless me with good things. It's what I've called the "candy dispenser God." I put in the prayer, and he gives me the blessing, all in accordance to my quotient of faithfulness. The thing is, when this faulty theology is confronted or when Christian film critics and pastors offer a thoughtful critique of the film, the response often seems to be, "Well, you're wrong. The movie made me feel great, and I feel encouraged, even convicted to pray more. And who are you to speak judgmentally and negatively about other Christians and what God is trying to do through their work? God inspired me and changed my life through this movie. How dare you question that?" If someone believes an experience to be good, and it inspires them to genuinely follow God more, does that make it true? If I come to a personal conclusion that is ultimately good--at least in my eyes--does it really matter how I got there? Why criticize the process if the end result is beneficial? Perhaps the ends justify the means. I've admittedly done this in reading the Bible. I've read passages and discerned God speaking to me through the words on the page, despite my knowledge that proper exegesis of the passage would not bring about the personal conclusions I was contemplating. Yet this personalized reading of Scripture still prompted me to be more faithful in my apprenticeship with Jesus and pursuit of his kingdom. Surely that's a good thing. So when someone believes their prayer life is improved after watching this film, who am I to judge? Another example: if I feel inspired to evangelize by texting all of my friends "God's Not Dead"--a tactic openly encouraged in the final moments of last year's faith-based hit of the same name--and someone actually chooses to believe Jesus through this (obscure, confusing, intrusive, ineffective) method, isn't that something worth celebrating? Who cares how it happens, as long as it happens? What if I'm feeling good about a film precisely because it is designed to manipulate my emotions? What if the belief system a film promotes is almost, but not quite, Christianity? What if my own personal faith is less like the Christianity inspired by Jesus and more like an American subculture inspired by American values and marketing tactics? The central goal of life is to be happy and to feel good about oneself. Experiencing significant pain, suffering, or sadness is likely due to a distance from God and not behaving as faithfully as one should. God does not need to be particularly involved in one's life except when God is needed to resolve a problem. He will intervene when called upon by good people in prayer. Good people--those who believe in God--go to heaven when they die. According to the National Study of Youth and Religion, MTD is the most common religious/spiritual belief amongst American teenagers and young adults, and likely reflects the same beliefs of their parents. This "almost Christian" belief system is ubiquitous in the American church; as a pastor, I have seen and experienced its effects for the past decade. These are faith-based films all right. But what faith are they promoting? In this genre of film, most or all of the Christians turn out happy, healthy, and smiling by the film's conclusion. The non-believers often are killed, jailed, or otherwise come to a painful end. This narrative structure aligns with Moralistic Therapeutic Deism's soteriology--good people are blessed and happy, while non-believing bad people experience suffering. The audience response, "It made me feel good!" certainly rings with MTD's belief system. Of course it makes you feel good! That's what God is meant to do for us. And you know something is true and beautiful if it's always positive and uplifting. Not only do these films make you feel good, they give you clear, practical instruction on how you are to behave in response to the film, a behavioral practice that is guaranteed to make your life happier and better. 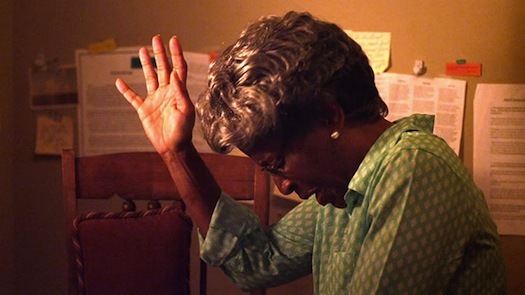 For War Room, it's "make a plan to pray more." For God's Not Dead, it's "text everyone about God now." These behavioral prompts are like the application points to a sermon, given a simplicity and an immediacy that makes for an easy discipleship. Having one's lifestyle and practices be changed by a film isn't wrong or bad--my own life has been significantly transformed by a few key moments in film--but faith-based films are more overt and didactic in their approach, and directly connect audience's response with their Christian faithfulness, i.e. good Christians will do what this film says. It's the filmic form of those Facebook memes prompting you to share a photo or Bible verse with all your friends, where the implications are clear: if you don't share, then you're not being true to Jesus. I imagine the recent box office success of War Room will be celebrated as a victory for God's kingdom, because in the paradigm of MTD, any sort of financial gain would obviously be considered a good thing and a clear answer to prayer. God rewards and blesses those who are faithful and obedient, right? MTD is also a very individualistic endeavor; there is nothing in its central tenets about the need for community or accountability. My faith is my faith, and who are you to question how I think and feel about God? This corresponds to my original question above about personal experience; it doesn't much matter if it's the true God as found in Jesus, as long as I'm a good person and happy and don't bother anyone else. After all, being a Christian is best summarized as being nice in the name of Jesus, right? At best, the filmmakers are ignorant of their filmic campaign for a false gospel of MTD, likely because they too have succumb to its pervasiveness in our culture. At worst, the filmmakers are keen marketers and moneymakers who have discovered an evangelical subculture all too willing to throw their money towards these well-marketed echo chambers that will keep MTD alive and well in the American church. Moralistic Therapeutic Deism is almost Christian, just enough that many of us may not even recognize the difference in ourselves. The response of "I liked it, so stop critiquing it" may be an indicator that our faith is placed in something less than the death-and-resurrection power found in Jesus and the reign of his kingdom values in our world. Jesus doesn't invite us to be nice so that everything works out to make us happy. He bids us to come and die, to live a life of sacrificial love, compassion, justice, and mercy. Prayer is not meant to fix all my problems or get me things I want; it is intended as a means of holistic transformation in the relational context of conversation and presence with the Divine. Evangelism cannot be summed up in a text message or an invitation to a poorly-made movie; sharing the good news requires my whole life, demonstrating the radical love and grace of Jesus for my neighbor as genuinely good news. Critiques of my beliefs and opinions and character are not bad or divisive; they are necessary aspects of Christian community as we spur one another on toward love and good deeds. In true Christianity, there is room for difference and grace. I am not saying that we cannot have differing opinions on films, or that the subculture of evangelical Christianity cannot have its own art and stories to celebrate. This is not the cynical rant of someone who believes Christians incapable of making good art, but as someone who believes we can--and should--make art that resonates with the truth and beauty found in Christ. I am concerned as a pastor and a film critic because it's not just that these films aren't that good, it's that they seem to advocate for a less-than-true form of Christianity. And audiences are buying it, both literally and spiritually. I'd rather see viewers seek out Paul Harrill's Something, Anything or Joshua Overbay's As It Is in Heaven, two recent films that are far more challenging to watch than most faith-based films, but have greater spiritual dividends. When it comes to faith-based films, let's be cautious about the underlying faith these films ultimately promote. It's almost Christian. When it comes to finding meaning, purpose, and reality, "almost" may not be enough. Update: The film As It is in Heaven I recommend in the final paragraph is Joshua Overbay's 2014 film available on Hulu Plus or Amazon Prime; it is about a pseudo-Christian doomsday cult. It is *NOT* this 2004 Swedish film currently streaming on Netflix with the exact same name. The link I provided above will take you directly to Overbay's film on Hulu. Please approach any film-watching experience with wisdom, discernment, caution, and grace. If you'd like a resource for growing as a wise and discerning movie watcher, check out my book, Jesus Goes to the Movies. Good review. Glad that I saw this on Twitter. MYD-type theology has been so destructive. Thank you! Approached this article skeptically, embraced it lovingly. Lately, my approach to "yet another complaint" (not just this film but EVERYTHING lately) is, "what is your positive suggestion?" I believe that we should weigh in but part of that weight should be a way out. Thank you for your views and I pray that you continue to stand upon the wall. Michael, I love your question, "what is your positive suggestion?" To critique and throw stones without offering a healthier, better alternative is simply whining (at best) or condemning (at worst). Check out the two films I listed at the bottom of this article, as well as my recent list of 12 Great Films about Christianity. "At worst, the filmmakers are keen marketers and moneymakers who have discovered an evangelical subculture all too willing to throw their money towards these well-marketed echo chambers that will keep MTD alive and well in the American church. " I find your review simplistic and just as one sided as the movie. There are more passages in the scripture about prayer being answered than about it not being answered. There are more passages in the Bible about the righteous man being blessed than about him not being blessed. There are more passages about the destruction of the wicked than about the wicked prospering. Yes Jesus calls us to surrender and to a willingness to suffer. Rain falls on the just and the unjust. I believe in James 1 which has been of great comfort to me through many trials. I believe in the suffering of the saints of Hebrews 11. But the Bible is full of heroes and villains from Noah and all the wicked who died, Joseph and his brothers, Moses and the Egyptians, Elijah and the Prophets of Baal and on and on. People love and are inspired by heroes and the bible is full of the promises of answered prayer and the prospering of the righteous. Maybe you should make a movie about suffering as a believer which is entirely valid but is no more Biblical or true than War Room. I have to agree somewhat. I see what you're saying, however I saw more emphasis on prayer than the "what am I gonna get for it?" I felt like the emphasis was more, don't give up until you've done all you can. I see most of the Kendrick films providing suggestions to correct issues instead of giving up and walking away. I see them more directed to believer than unbelievers who are being reminded to not take the secular response to issues, but to use the tools provided for us. Jonathan, I agree that there are many passages in Scripture affirming the hope we have in Christ, and that this hope is certain and true. Romans 5:3-5 has been a source of comfort for me, that in God's kingdom economy, suffering ultimately leads to hope. The trials and sufferings are often not exactly legitimate suffering--losing a football game, having a teacher get upset with you, etc. WAR ROOM (and FIREPROOF before it) do address marital struggles and God's power to strengthen and heal marriages, which is worth noting. But those struggles and conflicts are still often overly simplistic and easily remedied in ways that don't ring true to experience, and could be developed a lot more. I'm not decrying the conflicts in the film, only noting that they could be handled better. A final question for you: Are you claiming in your opening sentence that the movie--I assume you mean WAR ROOM--is simplistic and one-sided? If so, can you help me understand the disagreement you have with the perspective in the article? I appreciate you articulating this review in such a way as as you did to help your readers critically think through what they are taking in. At first I didn't read it because I thought it was going to be another critique in how most art done by Christians falls short in quality; but I love how you are arguing for movie watchers to seek greater spiritual dividends. As I have dialogued with many churched people about movies like this, they seem to watch with simplistic eyes. And I can't fault them for walking away encouraged. But like you, I want more both from these movies and more from these people to want more than just spiritual candy. If movie watchers are going for a here and now satisfaction that informs their theology (candy dispensing God), then they are feeding themselves an unhealthy diet. But if we can get movie watchers to discern what they watch (filter through their theology), then they will likely walk away with a greater spiritual dividend. Here's a glass half full perspective: as I was reading your thoughts I reflected on a theme found in Scripture where all throughout there are pictures of glorious endings for the righteous and the wicked find destruction (like in Proverbs 10:16). It seems that many money-making movies have this sort of theme...perhaps people are buying tickets to be encouraged to that end. Thank you for your drive and putting your critical thinking skills to work for the betterment of your readers. Keep on keeping on. Thanks Jason, great thoughts! I like the metaphor you create of an unhealthy diet, and how the films we consume--faith-based or otherwise--may contribute to either our flourishing or our detriment, depending on the merit of that film. I'd be interested to know if you've seen it. And what you made of the gospel presentation in the movie. I wonder too, since this article doesn't fit the movie War Room at all. The whole time I was reading the article, it made me think about "Facing the Giants" - which had an incredible scene with a linebacker bear-crawling and a coach barking to prove that "he had more inside himself. Which is true, but also, sort of, not true. Not a whole lot of "gospel" in "you have more inside yourself, you just need to unlock it." You know? But whatever. That scene was really good. It was the sugary ending that made me sick to my stomach, when the main character's wife, who was facing chronic infertility was suddenly pregnant. This butterflies and rainbows promise that "everything will be okay in the end, for sure" which is true, of course, but not necessarily in this life. Nobody wants the Cross, I guess. Me especially. And to be reminded of the inevitable crucible of suffering isn't fun to think about. I'd rather a False God who exists for me. I'm reminded of the third (and I suppose) primary temptation of Jesus: to be Messiah without the suffering. When Peter politely suggest that Jesus need not do this, Jesus whipped around with a harshness that's tough to read. I buy into the same lie: mature and Christlike without self-denial and suffering. The author of those lies is the same. Good thoughts, David. I agree with you that "everything will be okay" only in that Christ's kingdom is certain and we have assured hope in Him. But that doesn't mean we will end up healthy, financially secure, or win the sports game because we prayed hard enough. God's presence sustains us both in times of being in the promised land and in exile, whatever season we find ourselves in. Exactly! I haven't seen the movie yet but the idea of how hard/long we pray determines the outcome would leave everyone never off their knees if they really believed it. Looking forward to the movie and am grateful for reading this article. I feel the same about many Christian movies. This article sounds a lot like the typical critical spirit within evangelicalism where we spend all our time critiquing those how are out there actual doing the work. We are our own worst enemy. I am not against movies with deeper, more developed points, and I am well aware of the reality that Christians are called to be willing to give up their lives in challenging ways. Tomorrow evening I will board a train to go to a village in a least reached region of India where those who hear the Gospel message could very well be persecuted if they respond. I get the hard stuff of the faith. But narratives, even the biblical ones, are not designed to show every facet of life, they are designed to show a portion. In War Room, the main character faced a terrible choice when she chose to pray and support her husband in the midst of the developing issues in her marriage. That is excruciating internal work. When I watched the movie two weeks ago in California, I sat between two women who were both left by their husbands. They were not under the illusion that the movie implied that everything would turn out well or that they could have saved their marriages if they had only prayed more. They did say, however, that the movie would have helped them respond in a better way to their husbands when they were married. That isn't mysogyny...that is the beginning steps of deep faithfulness when a woman realizes that her contribution to the marriage has been less than helpful and she turns to the Lord for His transforming work. And let me tell you, it works. Two of the actresses in the film are bold women of faith who have worked with thousands upon thousands of women...let's be humble about assuming they didn't know what they were doing when they decided to help make this movie...particularly if you are going to use a grid so deeply steeped in American cultural biases (Misogyny? Really?). Again, with God's Not Dead...the text thing wasn't the point of the movie. I don't know a single person who thought that if they failed to text people "God's Not Dead" that it had any implications regarding their faithfulness. It was just for fun. The main character had to stand up to a professor who was belittling his faith. That is an extremely challenging thing to do in academia. It also dealt rather clearly with the concept of Hell, something you claim that therapeutic deists don't believe (all good people go to heaven.) It is true that these movies are portrayed with more simple storylines that are representative and symbolic of human experience rather than the ultra realism that the secular world is so enamored with. But the upper middle class white yuppie Christian snobbery that likes to feel sophisticated in their taste according to the standards of the world is not the paradigm by which we need to organize our discipleship and evangelism. The biblical stories are full of a type of romanticism...the faithful shepherd boy is raised to be king, the prostitute is used to conquer a city and ends up in the ancestral line of the Messiah, the barren woman is given a son who becomes the spiritual leader of the people of God. The realism of the world gets turned on its head in the upside down world where ether is a God of justice who loves to bless. It might be good to check out Leland Ryken's work on literary criticism regarding the poetics of biblical narratives. These movies represented something to people that was biblical. Getting down on our knees to pray in earnest is a biblical concept. A final point, is it interesting that the financial success of the movie is turned against it in this article as if by being successful, the producers are implying some health and wealth Gospel, even though in the movie itself, choosing to honor God clearly brought financial loss to the main characters (both because they chose to repent of former sin and because the husband took a job that brought a major cut in salary). Anonymous, I have a comment policy to not post anonymous comments, but this post was a much more substantial and thoughtful response than many I've received, and I'm grateful for a critique that actually deals with the article's content. I absolutely agree with your statement: "The realism of the world gets turned on its head in the upside down world where ether [sic] is a God of justice who loves to bless." The values of the kingdom of Jesus turn reality upside down, which is why I'm concerned when American cultural values are often equated with Christ's values in many (not all) faith-based films. I'm unsure if you're referring to me when you write "...the upper middle class white yuppie Christian snobbery that likes to feel sophisticated in their taste according to the standards of the world is not the paradigm by which we need to organize our discipleship and evangelism." I'd agree with that sentiment too, and actually intended to confront a snobbery of sorts in this article, the snobbery of "All faith-based films are inherently good, and no one can/should say otherwise." It's saddening to read some of the condemning ad hominem remarks directed towards me and my character made by (presumably) Christians who really liked WAR ROOM and GOD'S NOT DEAD, but that response is perhaps indicative of the sort of faith I'm addressing here, one that is quite defensive and often lacking in grace. Snobbery has to do with elitism and being closed towards others' ideas and beliefs, which is quite the opposite of my intent, as summarized in my statement: "In true Christianity, there is room for difference and grace. I am not saying that we cannot have differing opinions on films, or that the subculture of evangelical Christianity cannot have its own art and stories to celebrate. This is not the cynical rant of someone who believes Christians incapable of making good art, but as someone who believes we can--and should--make art that resonates with the truth and beauty found in Christ." So, Anonymous, as you're traveling within India in order to share the good news of Jesus, know that I've prayed for you in your gospel endeavors. A friend shared your post on Facebook, and this is how I came across it. I must say, I do not see things exactly as you have while dissecting the movies you did in this article. I am not even sure where to begin.... How is a Christian movie suppose to reveal the truth of the Christian life in a 2 hour film while being entertaining? I suppose many feel this is an easy endeavor, but it is not. These films are in a sense "entertainment", and at the same time a "message" is being delivered. There is a message in everything we watch. By no means do I make light of the grand importance of sharing the truth of God's Word correctly. Nor, am I saying that Christian film makers have liberty to lighten what a true Christian walk should be. I do believe the Kendrick Brother's motives are for the glory of God, not man. I did not walk away thinking they made light of abusive marriages, nor a prejudice against women (misogyny). I was welled with tears and my heart was heavy over many parts of this movie. Maybe, because I could identify. I never sensed a light-heartedness about it... this is my simple humble opinion. I do understand that there is a false Christianity within the body of Christ. I do believe there is a MTD (Moralistic Therapeutic Deism) at work in this land as the you spoke of in this article. I also believe the grace of God is abused and misused. I also believe the pendulum swings to extremes of Pharisaical legalism and to "grace filled" licentious acts. It is a continuous battle that has been happening since the time of Christ, and even before Christ. I understand this article was ultimately not putting down this movie because of bad production, but bad theology. Yet, I feel the need to share these following points. So many Christians spend so much time watching secular TV and secular movies and embrace them in their worldly falsehood in the name of entertainment or the need to relate to society. When I say embrace, I mean they watch it with the thoughts "Yes, I know this is false and ungodly, but I am going to watch it anyway. I want to relax, unwind and be entertained." Is this the way of Christ? Basically, there is a justification to fill oneself up with pure junk as godly people. I do not believe this is legalistic to think this way, it is biblical. I have heard so many Christians put down Christian efforts to make godly film. It is a bit maddening to me. Yet, I see them embrace a secular film with an overall ungodly message because it has excellent cinematography, it was entertaining, or it had great acting and depth of character or a great plot. If we our honest with ourselves, we are often judging with worldly standards and not God's. We are to be discerning people and compare all things to the Word of God. But, If we are rightly discerning we would not be caught up in worldly entertainment as we are. If we would be honest with ourselves, we would admit we are entertaining ourselves to death by desensitizing ourselves to sin. I know many believe that because the art of creativity is from God and we are all made in His image therefore we can embrace all forms of art be it TV, movie, literature, art, or music. I believe there is a fine line of discernment that must go with this thought for God's Word says to flee from evil, not embrace it. It says, "Blessed is the man Who walks not in the counsel of the ungodly, Nor stands in the path of sinners, Nor sits in the seat of the scornful; But his delight is in the law of the Lord,And in His law he meditates day and night." (Psalm 1:1-2) We are not to conform to this world. Yes, Jesus ate with sinners, but He sat and ate with sinner to "bring them Truth and to bring them to repentance". I want to address how the movie, or if the War Room movie promoted MTD thinking. Basically, those who embrace MTD are people who are partaking of a false theology that believes that God wants them to behave in order to be "good". The truth of the matter is that God calls His people to be holy, not good. We can not make ourselves good. It is a work of God. Did the movie portray this? MTD people also believe that God wants them to be happy and well adjusted people. The truth is that God gives His children by His grace the means and desires to follow Him, to trust Him and to glorify Him in all that they do by the power of His Spirit. We will have underlying peace despite circumstances because of our hope in Him. Did War Room portray this? The MTD people also believe that God made the world as a Creator, but He is not personally involved in their daily lives (deism). The truth is that He is very involved in our lives. He sent His Son Jesus to come down and become a man and walk amongst us. He was Emmanuel (God is with us). He lived a sinless life as an example to us all and to be the sacrificial Lamb for the sins of the world. He took the wrath of God in our place. He took our deserved punishment to set us free from sin and to gives us a free gift of eternal life through our faith in Him. That is a very involved God. I did not see this movie promote God as uninvolved. Sure, there was a happy ending, but it was not a perfect ending. There were consequences to sin, there was owning up to sin, there was grace shown, there was a dependence upon God shown. Was the full gospel spoken? Honestly, I do not think so (need to watch it again). Was this movie supposed to save people? No, only God can save people. Did War Room leave people with a false hope and only give a feel good message? I do not think so. There was real life struggles, temptations and sin in this movie. Did it show evil as something good or did it show consequences to sin? It showed consequences for sin. Did it show that it is up to man to change himself or did it show that we need God's intervention? I believe it should that we needed God's intervention. Was self elevated over God in being able to overcome one's sin? I may need to see it again, but I thought the theme was was turning to God with repentance and surrendering to Him in prayer. Did they show genuine sorrow from sin and repentance? I believe they showed genuine sorrow numerous times with repentful hearts. Did it show that we only turn to God when in need? Initially, it was "a need" that brought them to God. It was a sin need. But, through the movie they were turning to God for all things. Though the prayer closet was emphasized, it was to show the importance of making God a priority in one's life without worldly distractions. Did it show that when we are good we will be blessed? Again, I do not think so. Though, there was a positive outcome in the heart and souls of this family because they started to think right about God and to follow the truth of His Word in faith, it does not necessarily promote "doing good" makes you good in God's sight. Nor do I feel the message was "if you pray, good will give you good things". This family had every "material" blessing before they starting praying and desiring to have their hearts right with God. The power of God's grace and their faith was seen through prayer. That is what I saw. Again, I need to see it again to listen to the exact words that were said by everyone throughout the movie. This movie portrayed this family as being Christians... or acclaiming to be Christians in a worldly way such as "going to church when they could make it" and "having a faith in God, but not giving Him much time in prayer". It is obvious by their priorities and lifestyle that a false Christianity was being lived, some would say a worldly Christianity. In the movie, they showed a friend (fellow believer if they were saved) holding the male character accountable as "iron sharpening iron" a couple of times as we are suppose to do. Was the main male character truly saved or was he unsaved? Was he a false convert? The movie only shows you the fruit of his life that was not Christ like. God's Word says we will know them by their fruit. This movie promoted "prayer" to the One true God. It promoted to pray scripture when we turn to God. Prayer is talked about 200 times in God's Word, and the word pray is used over 350 times. So many people who call themselves Christians follow a ritualistic man made prayer life. This movie showed an active powerful love for God through their active real prayer life with Him. Many godly Christians would say that their prayer life has a direct impact on their walk, and that the lack of prayer and lack of being in His Word greatly affects their walk. Is that works righteousness? I do not think so. As true born-again believers (followers of Christ), it is grace that brings us to God. It is His grace that brings us to His Word and brings us to prayer. John MacArthur says, "Prayer is normal to the Christian as breathing is to the human." I would add that it SHOULD be as normal as breathing, but it is not. We are to pray in the Spirit of God, the living active Spirit and the living active Word that God has given us. I believe this movie showed that our prayer life must align with God's Word. Prayer gets our heart, soul and mind on God and off of ourselves and circumstances. Prayer shows we trust God with our life. The movie showed that prayer is communing with God. It did not show extra-biblical revelation in prayer. It did not show mystical prayer. It did not show contemplative prayer.. it showed biblical prayer. It did not show that by prayer we are "better" people. Of course, when we are right with God through His Son Jesus we should have fruit by living better lives as we live out the power of His grace in holiness for His name's sake. I may be reading more into the movie then what was meant, but I sensed the main female character(s) had come to the understanding of Psalm 23... "He makes me to lie down in green pastures; He leads me beside the still waters. He restores my soul; He leads me in the paths of righteousness For His name’s sake. Yea, though I walk through the valley of the shadow of death, I will fear no evil; For You are with me; Your rod and Your staff, they comfort me." God's Word comforts me. I will not say this movie was perfect, nor that it is infalliable. It was made by man, not God. I believe as Christians it is biblical to encourage one another to do good and to follow the way of Christ. I do believe we need to go to one another if someone sins against us and we should go to them to bring repentance. I believe we need to exhort one another unto godliness according to the Word. I believe we need to rebuke one another if sin is blatant and unconfessed as sin. But, before we do any of these things we must turn to God in prayer and we must be in His will. It is our love for one another that causes us to do good for one another. It is the love and forgiveness of Christ upon our own undeserving lives that should compels us to do these things. Many of these things were not spoken in this movie, but they were showed. In my mind, a movie can only capture so much. But, I am not a movie connoisseur. I am not a professor of English, I am not an editor of Faith and Spirituality in Masters of World Cinema (as the author of the article in Christian Today is). I am not a Youth Pastor, nor a lover of film (as you are). I do not spend my life watching movies and critiquing them. But, I do hold all things to God's Word. I try to be a Berean in ALL things as I bring things into my heart, mind and soul. This film may have targeted a certain group of people. I know that I related to this film, so maybe it was targetting a Christian homeschool mom of four children. My children related to this movie. I am follower of Christ who happens to live in a higher income level than many (I share this as relative to the movie and in some of the critiques. This is said with no boasting for we have what we have only by the grace of God). Did I relate to it because of this? Maybe. I am a Christian wife who has had less than a perfect marriage where struggles have occurred in some similar ways to the film in different degrees. This movie did show a reality of life even if it was "shallow in character development" as some have shared in reviews. If it was preachy, maybe it is because one of the director's is a pastor. I like going to church and I like sermons. So, for me I say, "Preach on." I do not believe a movie can fix people, nor do I believe it can relate to every soul in every way. It is only God through His Son Jesus that can change/ fix man. In midst of the harsh criticism of this movie, I still like it. Maybe, my own personal knowledge of God's Word filled in any blanks for me. Maybe, I related to the issues at hand. Maybe there was actual real life sin brought forward in this movie that people, such as myself, could relate with through out my life as sanctification has occurred and burned out these sinful impurities such as ego, pride, anger, lust, arrogance, poor parenting, materialism, selfishness and the consequences of these sins... a poor marriage, hurting souls, poor parenting, a broken relationship with your children and most important a broken shallow relationship with God. Was it a deep movie... No, but it was deep enough to get their point across. I will end with this... I walked away being reminded that we must humble ourselves before God and we must pray more fervently for our families and this depraved world that we live. Jesus conquered the grave and He is sitting at the right hand of the Father. We must call upon Him in the battle at hand. We must see our battle is spiritual. a Spiritual war. As Ephesians 6:12 says, "For our struggle is not against flesh and blood, but against the rulers, against the powers, against the world forces of this darkness, against the spiritual forces of wickedness in the heavenly places." It is not by our might or power, but by the power and might of the Spirit of God. (Cont.) One more thing (-; I want to say that I am not a Beth Moore fan. I have in the past done some of her book/ bible studies, but I have come to an understanding that she does bring out some "extra-biblical" nonsense as she tries to empower women. She also unites "sisters" in an ecumenical way that I see as unbiblical. Cher Marie, thank you so much for your well-articulated, thoughtful, personal, and gracious response! There is so much I want to affirm--that Christians often unthinkingly watch movies without recognizing sin, that the film *was* targeted to folks like you and me (upper-middle class American evangelical Christians), and that it is truly only Christ who can transform and save us. The purpose behind this post was for Christian audiences to really think and prayerfully discern what they're choosing to watch--faith-based or otherwise--and how that may in turn affect their faith and character. I explore so many of the ideas you bring up in my book "Jesus Goes to the Movies." So, thanks for your comment! I saw it twice and loved it. We're not going to create a perfect book or movie in this world, and even if a did, the fault-finders world still stay away, and obviously not having seen the works, themselves and evading the question when asked,, counting on hearsay, rise up and discourage people from going and receiving a life- changing blessing. Jesus said, "Those who are not against us are for us." I imagine He's glad to see there's a well-written, well-acted movie, yes, by the world's standards, that lifts Him up, shows people writing down Bible verses, a father repenting in tears, both crying out to Him, and receiving His help to be better spouses and parents. Well written and insightful. Thanks for helping folks understand that theology matters....practically.